De Redondo, V., Arencon, D., De Sousa Pais, M., V. J. 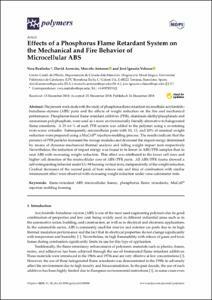 Effects of a phosphorus flame retardant system on the mechanical and fire behavior of microcellular ABS. "Polymers", 26 Desembre 2018, vol. 11, núm. 1, p. 30-1-30-21.